Watch out! There’s a cleverly-crafted link going about this morning that, if you click it, automatically kicks you out of the MegaLounge! This link was originally posted to /r/MegaLounge. See more things from Dan's Reddit account. ThinkGeek can always be relied upon for a good April Fools’, and this year is no exception. Of their prank products, my favourite is clearly the Anti-3D glasses, which completely filter out the left channel from 3D movies, allowing you to watch them in 2D. Geocachers amongst you might be pleased by the Nano Alarm container, which sounds a high-pitched alarm when a human body comes near it, making it easier to find. Actually, I’d have found it a more-amusing prank if they’d claimed it detects interference in GPS signals caused by a nearby GPS receiver. An article on IPv4.5 claims that we ran out of IPv4 addresses completely this morning and, with IPv6 still far from fully-deployed, we’re having to implement IPv4.5 as an emergency measure. IPv4.5 shares IP adddresses between people at opposite sides of the globe, giving priority to those on the “day” side, so there’s a slight risk that some traffic might be mis-directed… but it’ll only be by nocturnal websurfers who are probably just on Facebook or Twitter anyway. EddEgg launches The Secret of the Isle of Monkey, (a parody of The Secret of Monkey Island) and it’s fabulous: far too much work went into this little April Fools’. I’ve found Gay Monopoly on BoardGameGeek, and I’m not sure if it’s a joke or not… BoardGameGeek’s already an April Fools in which they become search engine “Geekdo” (try searching for “Catan”… or any other board game… on it). The photos of Gay Monopoly look remarkably believable, but it’s hard to take anything seriously today. 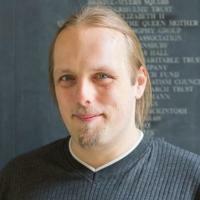 The Pirate Bay has become The Pirat eBay, and has released a blog post claiming that they bought the rights to eBay on eBay and have since re-branded. Google are well known for their April Fools’ Day pranks, and there are a good number of fantastic ones this year, but my favourite is GMail Motion, motion-sensitive controls based on body movements by which you can interact with your email. Well-worth a look. Have a great April Fools Day! Play a prank on somebody for me. And, if you don’t want to get caught out yourself, why not install the Do Not Fool add-on for Firefox, which passes a Do-Not-Fool header to every web site you visit, requesting that the site does not display to you any prank content but only genuine pages. I’ve always had a thing for big, overcomplicated April Fools’ gags. Traditionally, we’d always play pranks on Penbryn Halls at the University, but it’s not so easy these days to gain access to halls of residence, now that they’ve installed door locks that don’t open by themselves when you so much as breathe hard on them, so I thought it was time to broaden my sights. I work for a company based in the Aberystwyth Technium on the marina. A few weeks ago, the Technium management had arranged for the installation of a new fence and automatic car park barriers, to allow the building to better control who has access to the offices’ car parking spaces (car parking spaces being a particularly valuable commodity in Aberystwyth). These barriers haven’t come online yet, but apparently they will “soon” (which is regional-government-speak for “someday, maybe”). Early on the morning of 1st April, I put out an e-mail to all resident companies at the Technium, spoofed so that it appeared to come from Technium management and emulating their writing style and the way that they typically send out bulk messages to the tenants. 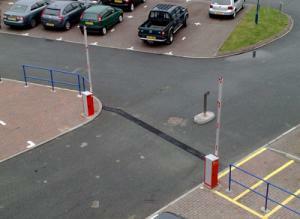 The key fobs for the new car park barrier system need to be ordered via an online application form . The application needs to be filled in as your key fobs will be uniquely linked to your vehicle. Once you have applied, central office will send out the key fobs to us in a week or two. Please fill in the form as soon as possible so that the key fobs all arrive at the same time. The techniumnetwork.info domain name is one that I’d picked up the day before for the best part of 49p on a special offer with a registrar – the real Technium website is at www.technium.co.uk, but I figured that people wouldn’t pay attention to the domain name: even the tenants here probably don’t spend much time, if any at all, on the Technium website. 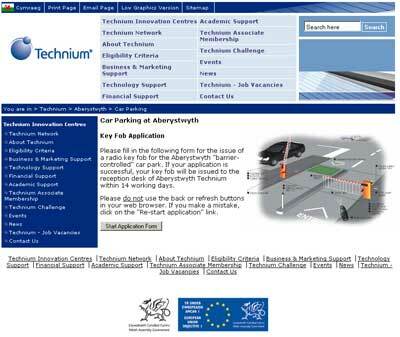 I stole the stylesheet and layout for the official website and adapted it to my purposes: there’s a mirror up now at http://techniumnetwork.scatmania.org/aberystwyth/carparking/ if you want to see for yourself. The site begins by looking like a genuine application form, asking for all of the key details – your personal and company information, basic details of your car – and slowly starts over many, many pages of forms to ask sillier and sillier questions. “What colour is your car?” is a drop-down with “Red” and “Other” as the only options. “What noise does your car make?” is accompanied by options like “Vroom!” and “Brum-brum.” Later questions ask whether or not your car is capable of transforming into a giant robot and challenge you to correctly identify road signs that have been altered in comedic ways. The trick worked, and many of the tenants were fooled… some of them well-past the point at which they should have thought the form was genuine; and almost all of them believed, even when they realised that the form was a joke, that it had been set up by the Technium themselves. 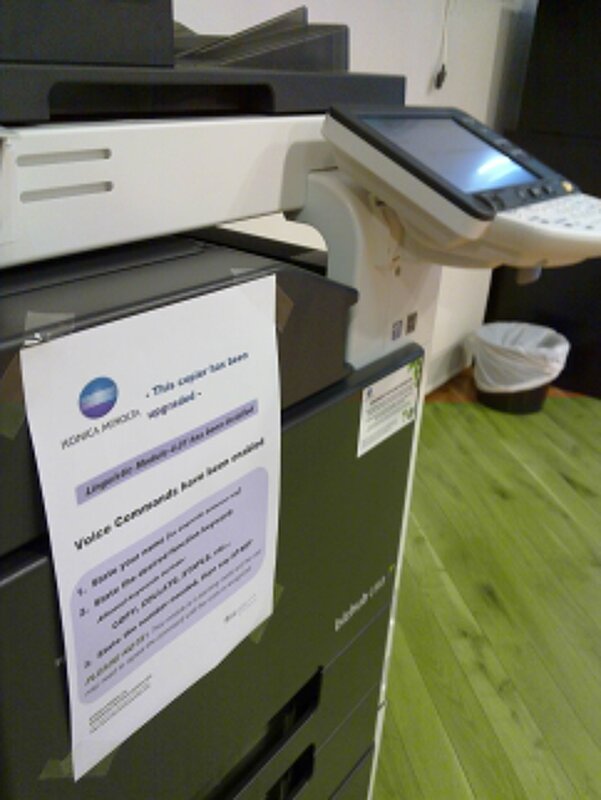 It was only when one tenant decided to pass a copy of the e-mail on to the real Sion Meredith that the building management heard anything about it, and, sadly, put a stop to it by sending out an e-mail to say that it was all a joke, and not one by them. After he’d worked out it was me that was behind it… I’d taken steps to make it obvious to anybody who bothered to check up on it, so as to maximise the understanding that it was, in the end, just a joke: the last thing I wanted was some humourless bureaucrat to see this gag (which did, of course, involve feigning the identity of a government employee) as a terrorist threat or something …he got his own back, though. He came up to my office at a few minutes to midday to inform me that he’s had to pass on my details to the Technium legal team, and he managed to make my heart skip a beat before I realised that he, too, was just having a joke. I had to leave the room when it first started to catch Simon out: I heard him phoning his wife to ask for a reminder of their cars’ number plates and had to excuse myself so as not to give the game away with my girlish giggling. So, that was all good, and far more successful than my backup plan which involved passing on missed call messages to co-workers to ask them to return a call to Rory Lyons at Captive Audience on 01244 380280. The number is actually the number for Chester Zoo: I so very nearly made some of the people I work with unwittingly call up Chester Zoo on the morning of April 1st and ask, “Can I speak to Rory Lyons, please?” It’s a good prank, anyway – I’ll save it for another time: or if you want to give it a go (it doesn’t even have to be April Fools’ Day, with a great joke like that), let me know how you get on! …seems to be to not text me me Google Calendar alerts this morning. So I didn’t get reminded to put the bins out, which I’ve kind-of come to rely on. Whoops! 1. A seven-ton atomic landmine, designed to prevent Soviet advance through West Germany, would have been kept warm while underground by being filled with live chickens (with enough food to keep them alive for a week). This (not an April Fool’s – really!) report brought to you by the BBC. Wierd.